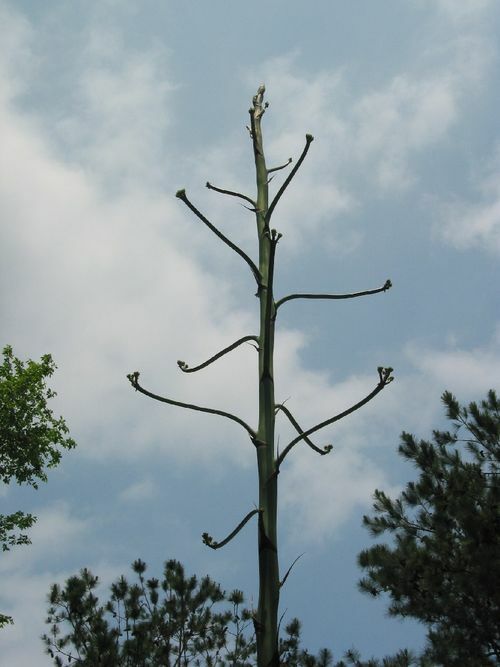 This info from Wikipedia..."It has a spreading rosette (about 4 m wide) of gray-green leaves up to meters 2(6 ft) long, each with a spiny margin and a heavy spike at the tip. Its common name derives from its habit of only occasionally flowering, but when it does, the spike with a cyme of big yellow flowers, may reach up to 8 meters (25 ft) in height. The plant dies after flowering, but produces suckers or adventitious shoots from the base, which continue its growth. The average life-span is around 28 years.